WASHINGTON — Tonight at 7:30 p.m. 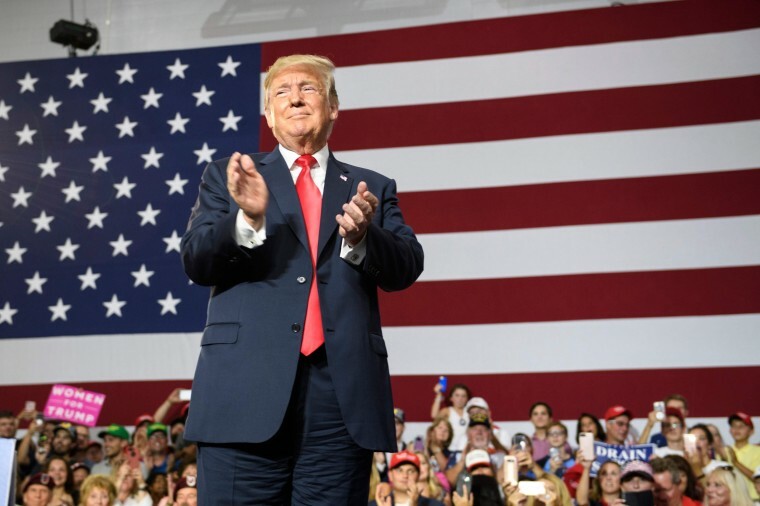 ET, President Donald Trump holds a rally in Council Bluffs, Iowa. Tomorrow, he heads to Pennsylvania. And on Friday, he campaigns in Ohio. All are states he won in 2016, and all are states where he and the Republican Party are currently struggling. In Iowa, there’s a good chance the GOP could lose the state’s governor’s mansion, as well as two House seats (IA-1 and IA-3, which includes Council Bluffs). In Michigan, Democrats appear poised for big wins up and down the ballot. Ditto in Minnesota (although the GOP is trying to pick up a couple of House seats in the rural parts of the state). In Ohio, Democratic Sen. Sherrod Brown is cruising to victory, while the gubernatorial race is a toss-up. In Pennsylvania, Democrats are way ahead in the Senate and governor’s races, and they could pick up four or five House seats. And in Wisconsin, Republican Gov. Scott Walker is in the fight of his political life. For all of the attention this cycle on the reddest of red Senate races — in North Dakota, Tennessee, Texas and West Virginia — one of the biggest developments of 2017-2018 is how Trump and the GOP are lagging in the states that ultimately decided the 2016 election. Which raises the question: Are Iowa, Michigan, Ohio, Pennsylvania and Wisconsin “Trump Country”? Or were these states more “Anti-Hillary Country?”? We could very well get an answer on Election Day 2018. “On behalf of our nation I want to apologize to Bret and the entire Kavanaugh family for the terrible pain and suffering you have been forced to endure. Those who step forward to serve our country deserve a fair and dignified evaluation, not a campaign of political and personal destruction, based on lies and deception. What happened to the Kavanaugh family violates every notion of fairness, decency and due process. Except Kavanaugh was never “proven innocent”; instead, he was confirmed by a 50-48 vote along (mostly) party lines. And according to a CNN poll released yesterday, 52 percent of Americans said they believe the women who made the charges against Kavanaugh, versus 38 percent who believe Kavanaugh. What’s more, 51 percent say they oppose Kavanaugh’s confirmation, versus 41 percent who support it (-10) – it was 38 percent favor, 39 percent not in favor a month ago (-1). If Rick Gates and the 2016 Trump campaign were looking at this, what else were they looking at?